A chance meeting on a street in Madrid forces Julieta (Emma Suarez) to confront the guilt and despair that she has been trying to suppress. Paralysed by grief, Julieta can no longer avoid her past (portrayed by Adriana Ugarte) when fate brought both love and loss into her life. Julieta is a visually stunning and deeply moving film from iconic filmmaker Pedro Almodvar. This dramatic tale of the love, loss and grief experienced by Julieta (and the other female characters in her life) is gripping and entrancing. Julieta is portrayed by two different actors (later and earlier Julieta) - a superb move from Almodovar. Early Julieta, wonderfully portrayed by Ugarte, is full of passion and vigor. However, Suarez’s superb performance as later Julieta reveals a haunted shell of her former self. Then, in a stunning cinematic masterstroke, Almodovar brings both Julietas together - it is then that we understand the toll that life has taken. 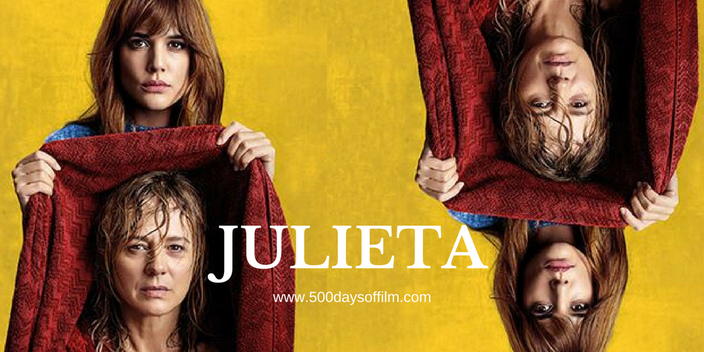 In contrast to its often mournful atmosphere, Julieta is vibrant and visually stunning to watch. One snowy scene featuring the appearance of a stag is absolutely breathtaking. Meanwhile, Almodovar imparts much from the clothes that his characters wear and the locations and interiors in which they find themselves - from the bright and breezy seaside home that Julieta shares with Daniel Grao’s Xoan, to her sterile apartment in Madrid. The more we learn about Julieta’s past, the more real she becomes and the more powerful the movie feels. I loved every minute of Almodovar's wonderful tale of love, loss and survival. I really enjoyed composer Alberto Iglesias' atmospheric score. Julieta is Pedro Almodvar’s 20th full-length feature film as director. Julieta is based on Alice Munro’s stories Chance, Soon and Silence. If you have, what did you think o0f Pedro Almodovar’s latest film? I would love to know. Do leave me a comment in the box below.